The PCE-LTL 1 data logger with one channel is powered by batteries and used to measure extremely low temperatures. The PCE-LTL 1 data logger has a wide temperature range from -86 ºC to +35 ºC. Its built-in semiconductor sensor allows you to use this instrument in many different fields. Thanks to its water-resistant case and the fact that it meets the FDA standard, the PCEL-LTL 1 data logger can be used in the food sector. The non-volatile internal memory ensures high data security. The PCE-LTL 1 data logger for low temperature can be programmed to power on/off the instrument through a PC. The data logger can be stopped at any time and the data can be still stored in the device. The software can automatically detect the PCE-LTL 1 data logger for low temperatures to allow an easy evaluation of the measuring values (optional with the base station). 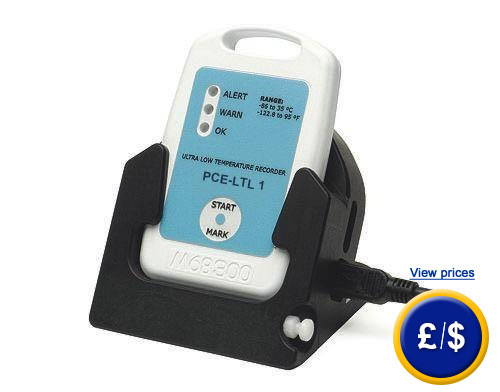 The PCE-LTL 1 data logger for low temperatures has an alarm indication via 3 LEDs which are illuminated when the programmed limit values are exceeded. Through the software, PCE-LTL 1 data logger is completely programmed to measure low temperatures. Measurement quota can be adjusted (from 5 seconds to 30 minutes) but you can also program the registration to start later (0... 30 days). Here you will find the digital data logger which will suit your needs. The software kit (includes USB cable and base station) is an additional component for data to be transferred from the PCE-LTL 1 data logger for low temperatures. 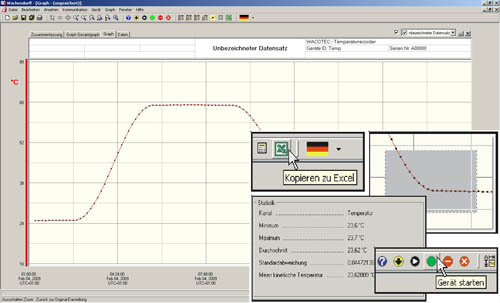 Please order the software with the data logger for low temperatures unless you already have a software or if you are ordering more than one data logger - in that case you will only need one software kit. Measurement quota/registration interval adjustable, 5 s ... 30 min. Operating conditions -86 ºC ... +55 ºC/0 ... 100% H.R. 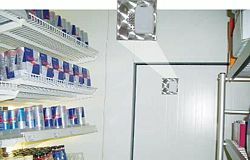 Thanks to its water-resistant plastic housing that meets the FDA standard, this data logger for low temperatures can be used in the food sector. 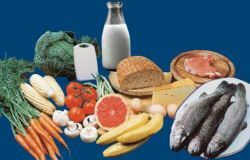 The data logger for low temperatures controls the temperature in the transport and storage of food and all the other fields which need a control of low temperatures. 1. Simultaneous analysis display of the registered data (easy to change to manual operation by pressing a key). 2. Real time registration: Presentation of measurement values in real time when values are simultaneously stored. 3. Graphic cursor: With only one click, the time, the measurement value, the parameter or the instrument number are displayed on the screen. 4. Value Chart: Continuous access to the chart for a detailed presentation of the measurement values. 5. Scale: An automatic scale function allows the automatic display of all measurement values. It is also possible to change the scale manually. 6. Format: You can individually select colour display, lines and many other parameters. 7. Statistical function: It can produce and represent the average value, the max/min values, variations, etc. 8. Data export: Data can be exported to different programs. For exporting data to EXCEL® you will only need one click. 1 x PCE-LTL 1 data logger for low temperatures, 1 x battery and user manual. 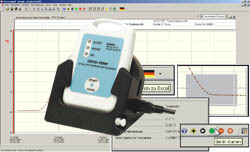 Order the software and the base station (software kit) separately to use the data logger. For companies that wish to include the PCE-LTL 1 data logger in their set of internal testing tools or for annual recalibrations. The ISO certificate includes a laboratory calibration and a control document with all the measurement values. The base station is delivered together with the software kit and the USB cable. When the base station is ordered, the software kit will be needed in order to program the data logger HACCP and for later readings. All the data can be registered and used. The data logger comes with resistant ABS plastic. The PCE-LTL 1 data logger for low temperatures is activated manually by means of a magnetic pin. It is located inside the base station. If the magnetic pin is lost, it is possible to order a new one.